Motor City Fence has helped architects, engineers, contractors, and private businesses design and build security and access control systems for all types of projects. Our company can provide innovative, site specific solutions to security and containment problems. 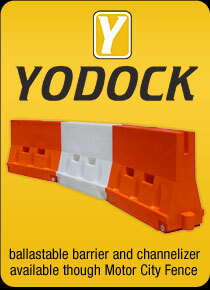 Please feel free to contact us today if you have any questions or need information regarding any of our fence products or our new line of Yodock, water filled road barriers. A Motor City Fence representative will be happy to provide you with all the information necessary to help you with your projects as quickly as possible.